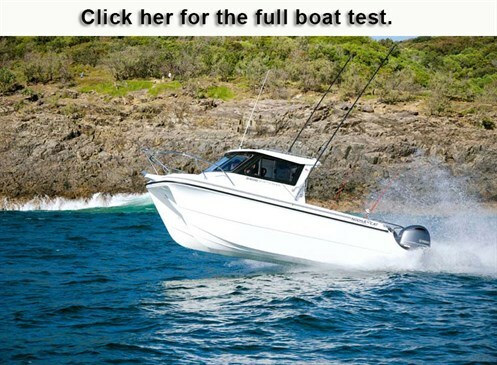 How do twin Yamaha F150 outboard motors handle a Noosa Cat 2400 powercat? I reckon the ratio of trailerable monohulls to power catamarans is around 98 per cent monos to just two per cent cats. Why? Local manufacturers are rare, especially for smaller cats, from five to eight metres. The hulls are by their nature quite specialised and the lower numbers available lead to limited knowledge of the boats. It’s a shame as I reckon if there were more powered catamarans on the water, more people would own them, simple as that. Indeed, once you been on a good powercat, I find them pretty hard to beat in a number of ways. I had the privilege of testing a Noosa Cat 2400 Series Open Cabin recently. Having owned and driven a number of power cat hulls in various sizes over the years, I’m always game to review new brands and models as it’s amazing how the characteristics in ride can vary. There is a style and technique to driving powered catamarans and for me it’s all about using the power to make them perform and feel good on the water. You can see below what we said about this boat. As for the handling and ride, our review boat was fitted with twin Yamaha F150 four-stroke outboard motors. With this marine engine setup, I wasn’t expecting wild performance figures considering the size and weight of the Noosa Cat 2400 review boat – but that was before climbing onto the throttles. The holeshot certainly surprised me as the twin Yamaha F150 four-stroke outboard motors delivered a two-stroke feel, blasting the 2400 instantly onto the plane. Besides the motors pumping up the holeshot boost, the hull design plays a big part and with the 2400 having a low-resistance and economical hull, the motors and hull definitely gel to make it all happen. Up and running, speed versus revs is another impressive characteristic in the 2400’s ride as the hull cruises at above average speeds but at low revs and with really good fuel consumption. Cruising at 24-28kt you’ll see 3500-4000rpm with a fuel burn of 35-50L/h in the mid-range – not bad at all, considering the twin motors. On the standard twin 225L fuel tanks you would get around 500km, which again is good going. Opening the throttles wide, the 2400 speeds to just over 40kt, though it chews a bit of fuel like any boat does when you wring its neck. You do need to consider twin motors chewing a bit more at WOT but at cruising speeds the extra consumption is marginal and to me it’s not a major concern as you gain peace of mind; one motor might crap itself but you’ll still get home without the cost of a tow. Perfectly matched to this boat, the twin Yamaha F150 outboard motors provide unrivalled power throughout the rev range yet purr away on the transom without overworking themselves. 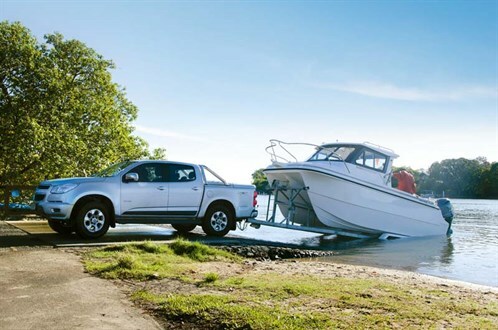 Featuring a 2.7-litre inline four-cylinder configuration with double overhead camshafts and four valves per cylinder, on the Noosa Cat 2400 the Yamaha F150 outboards deliver an impressive holeshot, perky top end, really good fuel economy in the middle of the rev range, and run smoothly and still pretty quietly even at higher revs. 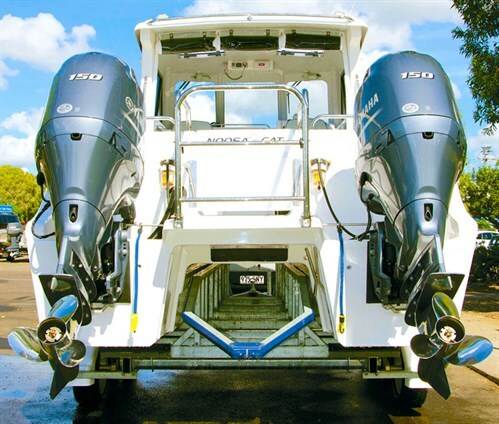 Featuring Yamaha’s classic slimline looks, eight-tooth dog clutch for smoother and quieter gear shifting, variable troll-speed control and being compatible with the new-generation Yamaha digital gauges and engine monitoring systems, this twin-motor set-up is ideally suited to the Noosa Cat 2400. See the full version of this review in Trade-A-Boat #479, June/July 2016. Why not subscribe today?